Through the first 17 appearances of her second pro season out of Florida State University, Williams has already surpassed her impressive rookie total of three goals scored during the 2016 regular season. Williams struck the net for the fourth time in 2017 on Saturday against the Chicago Red Stars, finishing off a free kick sent into the box by Mallory Pugh. 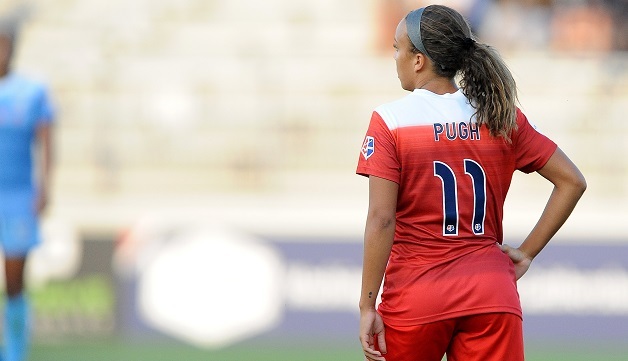 It was Pugh’s first career assist as a pro player. The Spirit has scored 63 percent of its goals in the second half this season, which is the second-highest mark in the league, behind only Sky Blue FC’s 71 percent. Only three other teams – Sky Blue (25), Orlando Pride (22) and Seattle Reign (21) – have scored more total second half goals than the Spirit. Washington’s Havana Solaun (5 goals), Francisca Ordega (4 goals) and Williams (4 goals) all find themselves within the top 20 list of the NWSL’s leading scorers, more than three quarters of the way into the regular season. Only two other teams, Seattle Reign and Orlando Pride, have more than two players on the list. Out of Washington’s first 19 regular season games, 14 have either been decided by one goal or ended in a draw. That trend of closely-contested games has been especially strong at home, where eight out of the Spirit’s nine games played at the Maryland SoccerPlex have ended with both sides within a goal of each other. Despite coming up short on the road against the league leaders, Washington controlled the majority of possession last time against North Carolina, holding the ball for 52.2 percent of the game. The Spirit racked up 387 passes with a 66.1 percent accuracy rate, compared to Carolina’s 350 total passes at a 63.4 percent accuracy clip.